Lydie is a young teacher who founds her activity on Nathalie and Sri TIWARIJI’s teaching over the last years. She has started a new period of training as a teacher at the KAIVALYADHAMA International College in Lonavla in India. Lydie has a degree in Economics (Keele University, England,1991) and a Master’s degree in management (MSG, School of Economics, Montpellier University, 1993). She then trained as a multimedia "creator" with a digital audiovisual specialty, DUT Paul Valéry University, Montpellier, 2000). She discovered Yoga with Nathalie. This practice answered a deep underlying quest and enlightened her as an individual. Nathalie asked her to take up her weekly classes on the Baillargues/St Bres location. 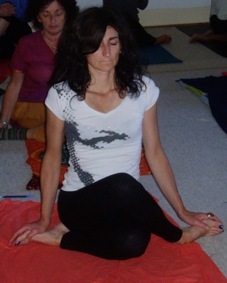 Lydie is a young teacher who founds her activity on Nathalieand Sri TIWARIJI’s teaching over the last years. She is a graduate of the Certification Course in Yoga from the International College of KAIVALYADHAMA in Lonavla in India. She enjoys guiding her students with care and kindness.